It's supremely early days for NVIDIA GeForce RTX technology and hardware, but despite the still-lingering new electronics smell NVIDIA are already priming the pump for a brand new bundle offer. If you're looking for a new GeForce RTX graphics card (and a game that will take advantage of its features) you might want to pay attention. Starting today and running until January 7th, gamers who purchase a new GeForce RTX 2080 Ti, RTX 2080 or RTX 2070-based GPU - alone or as part of a system - will receive a copy of EA's franchise FPS Battlefield V as part of the Game One, Game RTX promotion. Battlefield V has a phased launch that began last week, and coinciding with the launch was the implementation of ray-traced reflections. This feature is only available on compatible graphics hardware - currently limited to GeForce RTX GPUs - through the Windows 10 DirectX Ray-tracing functionality. Of course, real-time ray tracing isn't the only feature exclusive to GeForce RTX. This week Wolfenstein II: The New Colossus rolls out NVIDIA Adaptive Shading, dynamically allocating shader resources to 3D objects depending on their complexity and line of sight movement to improve overall performance. The Final Fantasy XV Windows Edition Benchmark became the first public implementation of NVIDIA's Deep Learning Super Sampling technique. And in the near future Shadow of the Tomb Raider will be the first title to integrate ray-traced shadows. 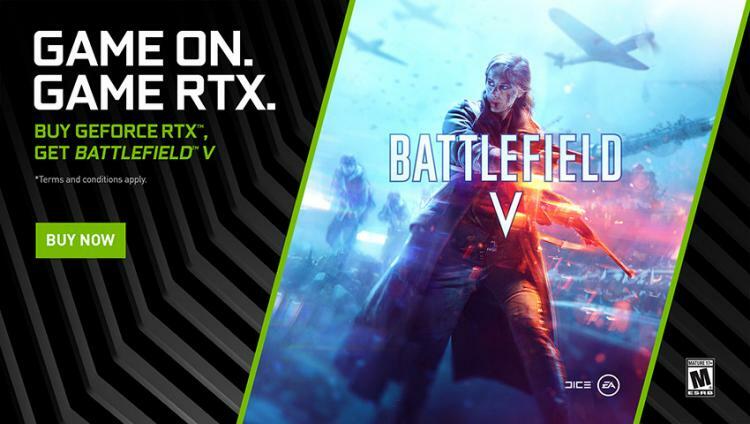 The GeForce RTX Battlefield V Bundle's terms and conditions for eligibility, including redemption instructions, can be found at https://www.nvidia.com/en-gb/geforce/campaigns/battlefield-v/. Alternatively, try your luck with NVIDIA's Battlefield V Ansel Screenshot Contest.